As coach Jeff Rioch looked ahead to the game he commented “We were in long dialogue with the powers that be prior to the league structures being announced and despite the club’s obvious concerns this made no difference whatsoever with the team still placed in North league. 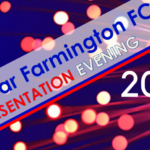 We were left with two options – fulfil the fixtures or forfeit the games which is not the Farmington way although it disappoints me that games have already been forfeited when the league is only two games in. Long established David Irons supporting long established club. The only change to last week’s team saw Carrie Hoggan replace the injured Jenny Egginton up front. The Ladies started very brightly and had majority of possession in the first 20 mins with Chloe Sturrock forcing the visiting keeper into a good stop with a back post volley. Bayside then had a good fifteen minute spell without really creating too much as the Forfar back four of Chelsie Coyle, Jane Ritchie, Pauline Harley and Megan Hassett worked well with keeper Rachelle Milton to cover for each other when required. Forfar took the upper hand again before half time and created a couple of chances before a great move in midfield saw Sandra Craig put Katie Hassett clear and she calmly fired home to give the home team a 1-0 half time lead. The second half was played in much the same vein with Hoggan and Ashleigh Smith’s running up front creating problems for Bayside and the energy in midfield of Emma Stewart, Hassett, Craig and Sturrock was immense considering the conditions. Frustratingly chances came and went before Megan Hassett was first to react knocking home when her sister Katie’s free kick was tipped onto the bar to double the lead with 20 minutes remaining. Bayside are however not undefeated in the league because they give up easily and as expected they came right back into the game, going three at the back and five in midfield to pressure the Forfar defence. A through ball was slotted home by Thomson to make it 2-1 and ensure a nervy last 15 minutes. To be fair it was more likely to be the home side who increased their lead rather than Bayside equalising but the chance to completely finish the game eluded Forfar. A composed, hard working last ten minutes however saw the team run out for a deserved three points, Bayside reduced to ten players in injury time for a second yellow card. 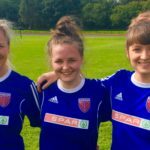 The club are delighted to welcome three players back to the Ladies with Megan Hassett, Sandra Craig and Katie Hassett all putting pen to paper this week after a successful training period. 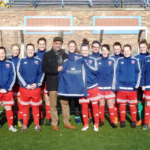 The side won 1-0 at the Saughton Enclosure with Jane Ritchie netting the only goal and Rioch is pleased with how his side have performed this season as they currently sit in fifth in the SWFL2 East. The team are in good form with four wins and a draw in the last five games with the intensity at training increasing as competition for places grows. 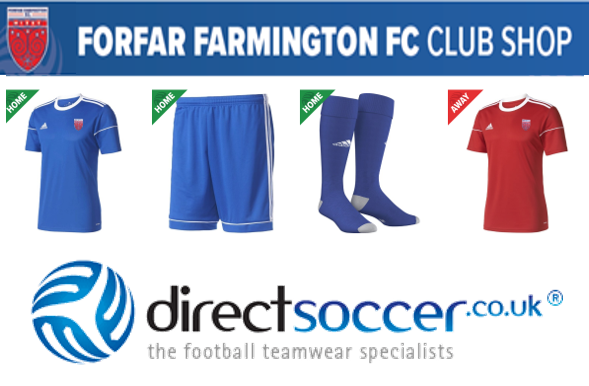 They have a break now before their next game away to title challengers Raith Rovers on 17th September. 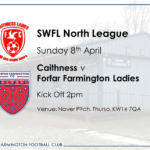 This game will be played at Starks Park, home of their male counterparts and will be a tough challenge for the Ladies, but one which they will relish. 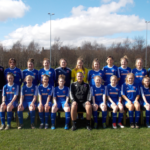 Our Ladies team put in a superb attacking performance on Sunday to comfortably defeat a young Letham team at Seven Acres in their last league game before the summer break. Ashleigh Smith scored seven goals in the victory, taking her tally to eleven goals in her last two games and sixteen for the season to date, which, given this is her first season in competitive football is a great achievement. The Ladies started the game quickly and Pauline Harley opened the scoring after two minutes; slotting home after Hannah Dryden had hit the post. Smith then started her run of goals with two composed finishes after running on to good through balls from midfield. 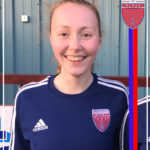 Emma Stewart got the fourth following a fantastic surge up the left wing before cutting in and finding the back of the net. Smith completed her hat trick before the break while adding another two, one a header from a right wing cross from Stewart. Harley netted her second with a fine finish from the edge of the box to put the team 8-0 up at half time in Perth. 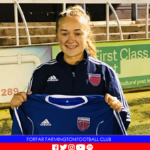 Letham started the second half in determined mood and kept Forfar at bay until the 65th minute when Hannah Dryden, playing as a striker, scored her first of the game. This was more than deserved as she had seen two efforts hit the woodwork in the first half. She went on to complete her hat trick with another two great strikes. Smith wasn’t finished either and she added two further second half goals to complete a double hat trick and add a seventh to her tally. Letham scored a late consolation from the penalty spot to deny Rachelle Milton and her defenders the clean sheet. This was a great squad effort with six players missing due to holidays, work and injury. Credit has to be given to Letham who kept going to the end with only the bare eleven available – this is their first season in senior football and they have some talented youngsters coming through to complement the more experienced players. This result leaves Forfar comfortably in the top half of the table on 18 points from eleven games played as they look forward to resuming in early August. 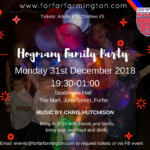 Rachelle Milton, Chelsie Coyle, Emily Thain (Lyndsey Clyne 71), Ellice Brannan, Amanda-Leigh Hay (Jessica McGregor 62) , Kirrin Gellatly (Monika Saravacjz 62), Emma Stewart, Pauline Harley, Emily Younger (Laura Younger 71), Ashleigh Smith, Hannah Dryden. 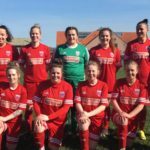 The Ladies side returned home after a long trip to Prestonpans with three points in the bag as substitute Cali Roberts scored two second half goals to seal a 4-2 win against Seton Ladies. With half a dozen players unavailable for various reasons the thirteen players on duty put in a sterling shift. It wasn’t the prettiest of games but Forfar started quickly with Stewart, Harley and Mulholland all spurning chances after beating the high Seton offside trap. As is the case when you don’t take chances you are always prone to conceding and a poor goal kick followed by equally poor marking allowed Seton to go in front. The side reacted well with a superb right wing cross from Mulholland being headed home by Pauline Harley. A poor kick from the Seton goalkeeper was controlled and dispatched back over her head into the net from all of 30 yards by Chelsie Coyle to put the team ahead at halftime. Seton however with the slope and slight wind at their backs struck again early in the 2nd half with a left wing cross not being dealt with and their striker scoring to square the game. 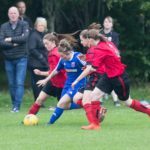 As was the case in last week against Hutchie Vale Development when they let slip a two goal lead, the ladies didn’t let it deter them and they went on to win this game too. A scramble in the box following a corner was rifled home by Cali Roberts and she scored again with quarter of an hour left when her left foot shot was well saved before she smashed the rebound home into the roof of the net. Both teams ended with 10 players as a Seton defender received her 2nd yellow in the 82nd minute before Forfar keeper Rachelle Milton went off injured with five minutes remaining, Harley deputising.